Thank you for purchasing our theme. It has an understandable documentation that is easy to setup. If you still have some questions that you could not find in this help file, please contact us on our forum. You can also follow us on Evatheme for our future themes, that you could be interested in. Thank you very much! To install this theme you must have a working version of WordPress already installed. You should ALWAYS be running the latest version of WordPress anyway, because otherwise you put your whole site at risk for potential threats. Never use an outdated version of WordPress. If you need help installing WordPress, follow the instructions in WordPress Codex. Below are all the useful links for WordPress information. You can now enable the Auto-Updating feature for Landyland. To do this, please first make sure that you have the Envato WordPress Toolkit plugin installed. If you haven't already installed this plugin, you should see a notification on the top of your Dashboard stating that some required plugins haven't been installed or activated. Install and activate all of the required plugins, including the Envato WordPress Toolkit. After you have installed and activated the Envato WordPress Toolkit, please go to Envato Toolkit from your dashboard and enter your Marketplace Username and API Key. You can find your API Key by logging into your profile on Themeforest and navigating to Profile > Settings > API Keys. 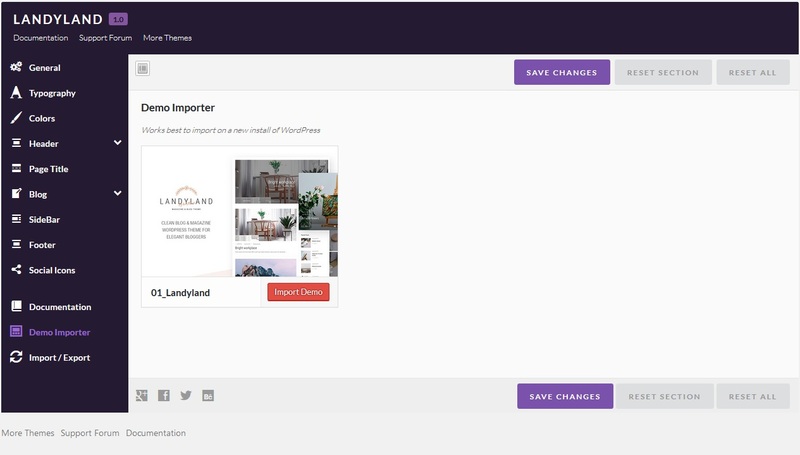 When you have entered your Marketplace Username and API Key and clicked Save Settings, a new tab will appear at the top of the screen named "Themes". Click on this tab to see all the themes you have purchased. If there is an update available for a theme, you will be notified here. To update your theme, just click on the "Update Automatically" link. Please note that each time you use the Auto-Update feature to update the theme, a backup file of the old version of the theme will be stored on your server in ".../wp-content/envato-backups". Copy/Replace content of the landyland folder to the /wp-content/themes/landyland folder of your web site. You can either start building your site from scratch, or import one of our demo sites and then modify it to fit your needs. We will now explain how to do the latter. Choose the demo site that you wish to import and click on the "Import Demo" button. What you need to do is follow the instructions that are taken from the Importing Content page from the WordPress website. To import from a WordPress export file into your blog follow these steps. Log into your site as an administrator. Make sure you activated your new theme before proceeding. Choose “WordPress” from the list. Upload the demo import/content.xml using the form provided on that page. You will then have the choice to import attachments, so click on the “Download and import file attachments” box. Please be patient while WordPress imports all the content. Posts, Pages, Projects, and Menus are imported. You will need assign the menu a theme location & you’ll need to configure widgets. This is a limitation of WordPress’ import system. Sometimes an error occurs. due to the large amount of content. - Evatheme Page Builder - This WordPress theme comes with the Drag and Drop Evatheme Page Builder plugin, which allows you to create custom page layouts with ease. - Evatheme Redux Framework - is a simple, truly extensible and fully responsive options framework for WordPress themes. - Contact Form 7 - Just another contact form plugin. Simple but flexible. For more information please head to Contact Form 7. - MailChimp for WordPress - MailChimp for WordPress by ibericode. Adds various highly effective sign-up methods to your site. This WordPress theme comes with the Evatheme Page Builder plugin, which allows you to create custom page layouts with ease. 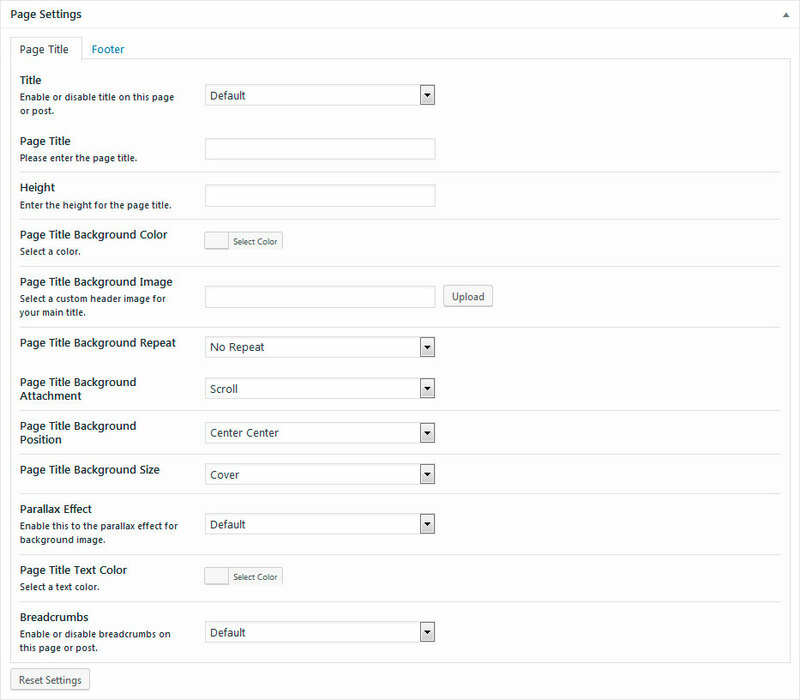 Here is the brief overview of all available page builder modules. 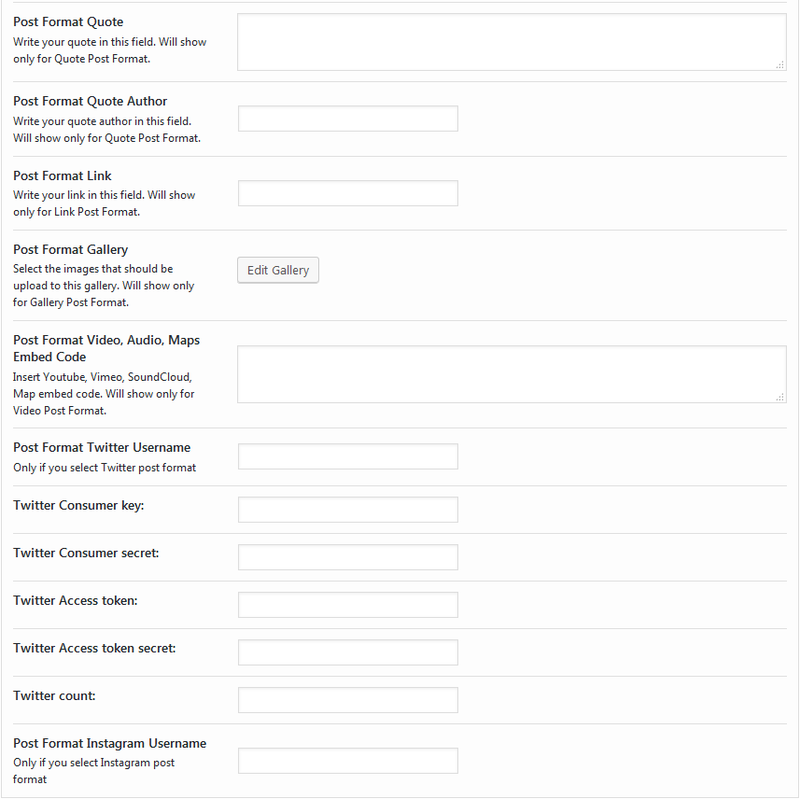 The plugin is built-in to the theme, it suggests to install Contact Form 7 automatically after theme activation. The first thing you have to do is to create a contact form. Go to the Contact plugin section. 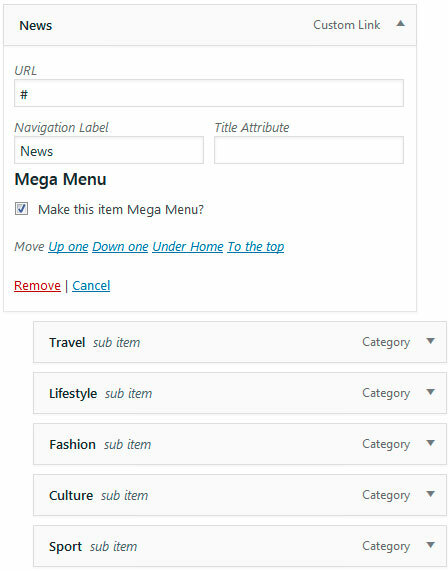 You can see it in the main WordPress menu. Please click Add New tab, it will redirect you the form field to add special code to the area. Save changes. Please copy the contact form shortcode, then open the page where you want to add the contact form and add "Contact Form7" element to the page, click edit and put the contact form shortcode into the Column Element of Evatheme Page Builder. To activate Primary Menu: Please go to Appearance > Menus > Manage Locations and choose from the drop down list "Primary Menu" and push the Select button, then save changes. Set the page for the front page: Please go to Settings > Reading > Front page displays > A static page (select below) set the page for the front page and save changes. 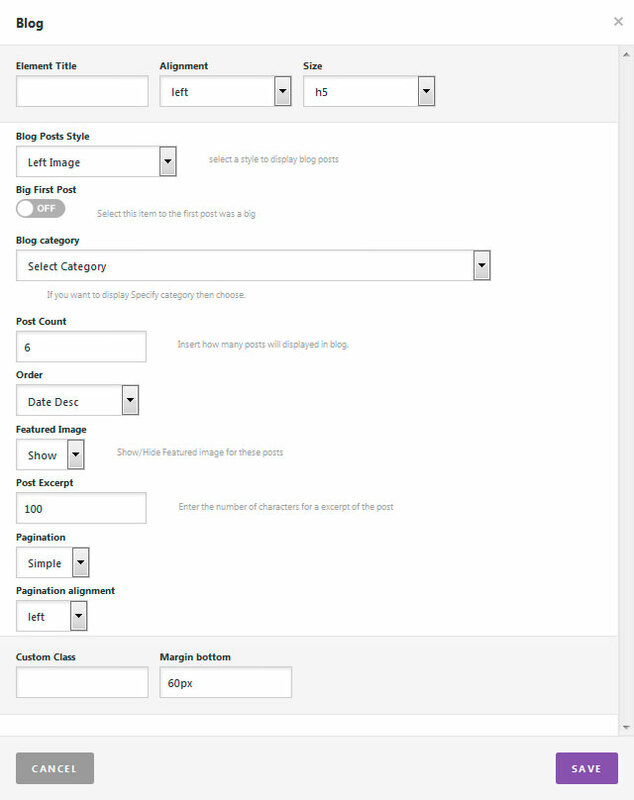 The theme has custom templates for creating non-standard pages. Please go to Pages -> click create a new Page or edit the required one -> on the right you can see "Page Attributes section". 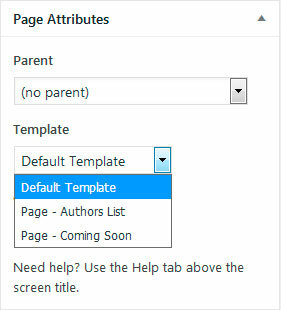 Don't select the Parent for the page, just indicate the required Template. When the template is selected, please click Publish button. 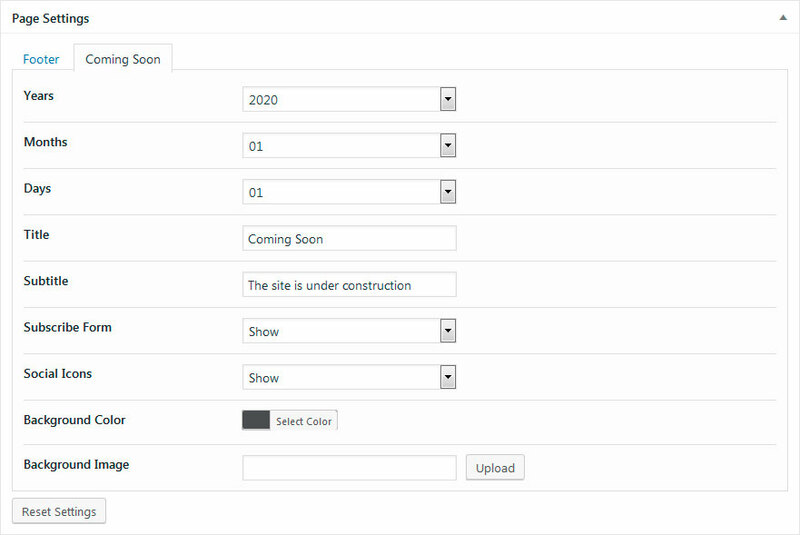 The Page will display the Page Settings according your template. The template is a good solution for website launching. Create a page with coundown timer. It allows to gather emails in a closed beta mode to notify visitors when the website will be available online. Each page has its own unique page header and footer settings. 8 styles of posts are available. Sorting posts by category, by date. Show or Hide Featured Image. 2 styles of Pagination. select a list of widgets. Landyland comes with 8 different post formats: Standard, Image, Gallery, Link, Quote, Video, Twitter, Instagram. When you're creating a new post, choose what post format you'd like and insert the necessary info. After selecting the format, you must fill in the field. 3. Evatheme Social Links - Display social links. Site also has custom widgets, made with html code. you need to select the default text widget and paste code to the textrea. Install the parent theme but don't activate it. Install and activate the child theme. Any direct customizations you make should be done in the child theme. You can place parent theme files into the child theme for customization and they will be given priority. If updates are made to the child theme, then the direct customizations you've made won't be overwritten when the parent theme is updated. More information about using WordPress Child themes. 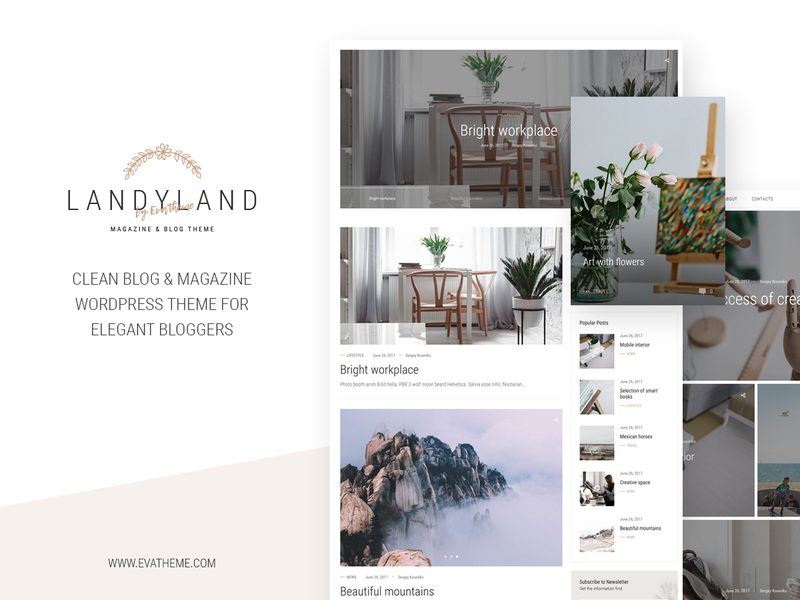 Go to /wp-content/themes/landyland/languages/ and open landyland.pot file.